Based on Yamahas Passol technology, this is a model proposing new added value packaged in a body design only an EV can offer and one that goes beyond the basic functions of a commuter vehicle. The concept is a metal art commuter. The highly unique body design proposes a new value sense. Featuring a switch-operated fold-up function run off the main electric motor, this vehicle can be folded up into a compact shape. Special design touches also make it easy to push when folded up. In this way, we have thrown out the premise that a motorcycle need a place in the parking lot and replaced it with a bike that can stand proudly as an art object in any room. 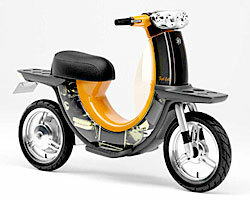 In other words, Yamaha has taken the EV into the realm of art. 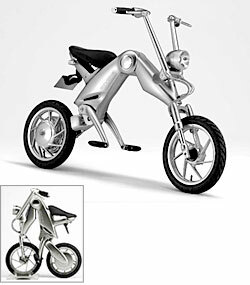 This EV model proposes a multi-function commuter. Features like fold-up handlebars, a pentagonal shaped aluminum frame, and operating sound selection function that lets you choose sounds, like the downloaded sounds you choose to personalize your cell phone bell, and convenient functions like a utility space that can hold a battery charger or a spare battery, have all been compressed into this minimum sized model that is small enough to fit in the trunk of a car. The wheelbase is a short 960mm (80mm shorter than the Passol) and the tires are 10-inch front and rear. 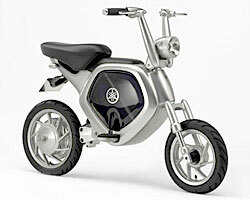 Taking the basic functions of the electric commuter Passol and increasing the battery capacity has created this long-distance model. With its built-in charger in a body the same size as the existing Passol, this model can be charged anywhere there is a 100V outlet. The aluminum frame has been given a buffed finish to enhance the metallic quality. The uniquely shaped flasher lamps, multi-reflector headlight and LED rear lamp all add distinctive accents to the exterior design. This model mounts a direct methanol type fuel cell (DMFC) unit with an output of 500W on a 50cc size bike to create a fuel cell commuter driven by a Passol-based motor. With a compact chassis that combines environmental friendliness with sufficient running distance, this model proposes a new type of business-use bike for the near future. The fuel is an easy-to-handle methanol-water mixture. Other features include GPS navigation and camera-equipped rear-view monitor. It is also equipped with a 300W AC outlet so that it can serve as an electricity source for outdoor leisure or emergency use. Today, research is also under way into the use of fuel cells to power everything from automobiles to personal computers, and it has been found that a DMFC system can be more space-efficient than a PEFC that runs purely on hydrogen. Because the converter unit of the PEFC system can be eliminated, it can also be made lighter. 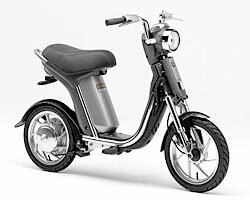 And, when it is intended to achieve running performance equivalent to a gasoline engine 50cc scooter, which means an average consumption of several hundred Watts of electricity, a DMFC has the potential for being a more compact system than a PEFC. This FC06 is a concept model that takes advantage of these DMFC characteristics to propose an EV personal vehicle with a viable running distance per refueling. Although the methanol that serves as the fuel is a flammable liquid, it is widely used as a non-hazardous substance when diluted in water below a certain concentration, which means it is easier to use than gasoline or kerosene. While some efforts will be necessary to attain a sufficient distribution system for this form of methanol as a fuel throughout the market, the fact that there would be no need to wait for the completion of a new large-scale distribution infrastructure makes this a practical form of fuel.